When it comes to distance running there are many proper steps that are often overlooked. In my experience I have come across a significant amount of runners who only run. With repetitive task activities, whether that be siting at a computer and typing all day or running, we need to develop an adequate maintenance program to offset the negative effects of these movements. When I say maintenance program, I am not only talking about exercise, but soft-tissue work, movement prep/warm-up, mobility/flexibility, and nutrition. When all of these things are combined in a way to maximize performance, we can reduce the chance of injury, become more efficient, and improve results. Below are a few tips on getting the most out of your runs. 1. Soft-Tissue Work is essential to maintain normal functioning tissue. It is proven that over time doing the same repetitive motions will cause our tissues to breakdown, become adhered to surrounding structures, and lose there proper function which will cause compensation and injury. There are several great soft-tissue treatment techniques out there such as Active Release Techniques (ART), Graston, Myofascial Release, and Sports Massage. My favorite is ART as it allows the practitioner to evaluate tissue tension, texture, function, and movement. Once the dysfunctional tissues are located, it uses specific protocols to regain the tissues natural function. How often does a runner need soft-tissue work you may ask? Well, it all depends. I always recommend that my clients listen to their bodies. Some come to me every few weeks, and others every few months. Another cheaper alternative would be to pick up a foam roller and trying this form of self-myofascial release. It’s not as effective as using a therapist, but it definitely makes a difference. Here is a great site talking about the benefits of ART on runners. 3. Completing a Movement Screen is possibly the most important part of exercising properly. Ask yourself, “Is what I do on a daily basis improving my weaknesses, or am I continuing to put fitness on top of dysfunction?” Now, when I say weakness I don’t mean the actual strength of a muscle, but are all parts of the body functioning correctly to put them through the stress you do running each and every time. A movement screen will take a look at the biomechanics of your movement. Are you compensating? Do you have adequate mobility in your joints? Do you have the necessary strength to complete basic movements? Movement screening breaks you down in order to build you back up. Each and every one of my clients completes a movement screen prior to beginning their program. This way I have a baseline of how their body is functioning and can then create a program to improve their mechanics and also achieve their fitness goals. I highly recommend finding a qualified personal trainer, athletic trainer, or physical therapist to assess your movement and develop a plan to improve these things. This will maximize your runs, allow you to become more efficient with less energy wasted, and most importantly reduce the chance of injury. 4. Many runners have trouble finding the time to Resistance Train. Resistance training is essential to distance runners because it provides the opportunity to improve performance, address any dysfunctional areas, and reduce injury. I don’t even necessarily think you need to go to the gym 3-4 days/week, but based on your movement screen what are some exercises you can do at home that will make you better. It is amazing at how many people have lost the natural movement patterns that we were born with. In a society that is becoming less active every year and sitting long hours at a desk, resistance training can help combat those negative effects. For those that spend the majority of their exercise each week running, complete a movement screen, and develop a corrective program that will take only 10-15 minutes per day. Remember, “A chain is no stronger than it’s weakest link, and life is after all a chain.” – William James. 5. Just as important as a warm-up, Cooling Down/Stretching is a simple and easy way to recover post-run, prevent muscle soreness, and offset the limitations in flexibility we get from exercising and then sitting down as we cool off. Try adding just a 3-5 minute cool down after your runs. This could be as simple as slowing down to a light jog or walking to allow your heart rate to decrease. Once you finish a brief cool down, run through both lower and upper body stretches to restore the muscles back to their resting length. A lot of research shows that we don’t necessarily gain range of motion while stretching the muscles when they are warm due to their elastic properties, but if we reset back to our “normal” tension we can prevent future tightness from developing. Not only will this prevent tightness but it will allow you to recover quicker and feel better the next day. 6. Let’s be honest, Nutrition is the key to it all. We can exercise all day but still not become truly healthy on a cellular level unless we improve our nutrition in some way. Eating right really isn’t that difficult. Strive to eat every 3-4 hours to increase metabolism, regulate blood sugar levels, and prevent excessive hunger which leads to overeating. Once you get that principle down it’s all about quality of food. This means reading labels, staying away from processed foods, and trying to eat as natural as possible. Yes, obviously this can be a more expensive way, but the results you can see from eating well go beyond just your running performance and impact your whole life. I recommend all my distance runner clients to wear a heart rate monitor. This will give a more exact representation of how many calories they are burning during their runs and throughout the day. Then emphasis can be placed on adequately refueling the body and getting enough proteins to prevent tissue degradation. Take the time to evaluate your current situation. Are any of the above areas missing in your exercise routine? If you are unsure, find a qualified fitness/health professional to evaluate your program and make the necessary changes to maximize results. Stay tuned until next time for ‘Exercises That All Runners Should Be Doing.’ Safe and healthy running to you all! 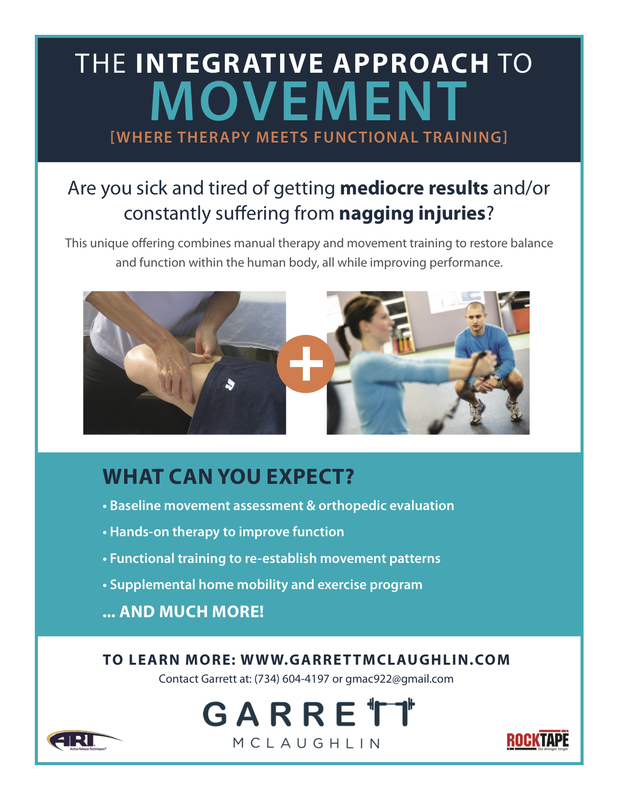 Garrett McLaughlin is a licensed athletic trainer, personal trainer, and certified active release techniques provider. He creates fitness and injury rehabilitation programs for athletes and the general population. Aside from achieving the client’s specific goal, Garrett is passionate about making each client move better in the process. With years working in collegiate and high school athletics, Garrett has trained cross-country/track athletes to some of their best times. Contact Garrett for more information on personal training, injury rehabilitation, or active release techniques. You can also check out his wellness page on Facebook for more frequent postings.